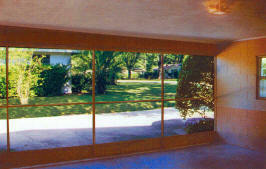 Garage Screens Sales, Installation, and Service. Now you can enjoy all the benefits of Florida’s sub tropical climate by enclosing your garage with a convertible screen slider. Our unit is designed to add to the beauty of your home. What better way to add an extra room than with “The Convertible.’ You can even use it for your car! Our heavy duty threshold insures many years of trouble free service and our exclusive 1″ roller adds ease of operation and dependability. 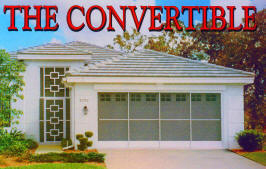 The Convertible” the ultimate in garage enclosures. The Convertible Garage Screen Enclosure is built to give you many years of pleasure with a number of features listed below.